I wanted to give a shout out to White Dragon Miniatures. I first saw this company at Salute last year, when they were promoting the launch of their Kickstarter for starship combat game Shattered Void. It wasn’t until I saw that project that I became aware of the range of 15mm Sci-Fi figures that they also produce, which I have fallen in love with. I had a chance to take some photos whilst at the recent ROBIN show. To complement that range of miniatures, they are just releasing a range of 15mm scenery – again, these are really impressive. 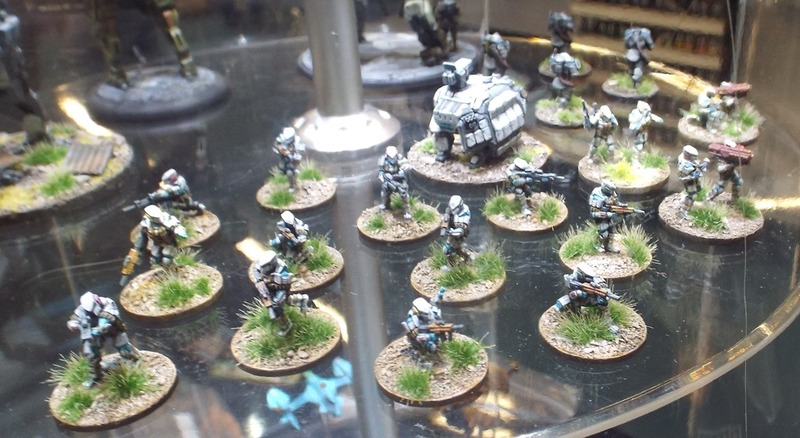 They also have a squad of the MTU miniatures in 28mm – though they are not on their webstore yet. These are a must buy. And of course, there are the ships from the Shattered Void range. All in all this is a fantastic range of miniatures – not bad for someone who runs his business from out of his bedroom! I’m pleased to say that we will be chatting to White Dragon on a future episode of Meeples & Miniatures Podcast.